The HydroPak portable power supplier is developed by Horizon and Millenium Cell. The HydroPak fuel cell is a portable power generator that can provide up to 14 hours of power with a single disposable cartridge. The $20 cartridges are water-activated, and have a shelf life of several years. The HydroPak stems from a collaboration between Horizon's fuel cells and Millennium Cell's "Hydrogen-on-Demand" storage technology. The companies hope to attract consumers and professionals who currently use generators and batteries for their remote power supply needs. The HydroPak could have applications for camping, construction, emergency, and other uses. The device, which is still in beta, is relatively inexpensive for a fuel cell product, costing around $400 in addition to the disposable cartridges. The HydroPak also has zero emissions, is lightweight, and operates with minimal noise. 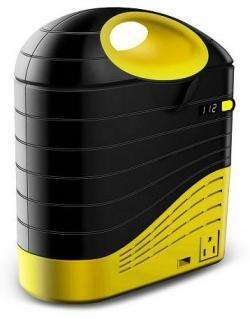 A water-activated cartridge can crank out 400 Watts through an AC outlet and two USB ports, so it can be used to power everything from portable lights, notebook computers, portable televisions and ad hoc communications networks, for a total of 14 continuous hours. Horizon and Millenium Cell plan to publicly debut the HydroPak at the Consumer Electronics Show (CES) at the Las Vegas Convention Center from January 7-10. On January 29-30, the companies will also demonstrate the product for the U.S. military at the Tactical Power Sources Summit 2008 at Georgetown University in Washington, D.C. In addition to the HydroPak, a HydroPak Mini will also be unveiled, which can be used in consumer devices such as cell phones, PDAs, and portable media players. Underwriters Laboratories is currently evaluating the product, and Horizon and Millenium Cell expect it to be approved by mid-2008. Then Horizon will manufacture several thousand units, which it plans to sell later in the year, with additional products appearing in 2009. Just the thing to keep in the trunk of your electric car.